American Girl Accelerate Adventure with Truly Me Sweepstakes – Win an American Girl doll! Win a Truly Me American Girl Doll and an American Girl RC Sports Car! ENTER SWEEPSTAKES HERE – American Girl Sweepstakes page. ENTRY LIMIT – Limit: You may enter one (1) time per day during the Promotion Period, regardless of method or combination of methods of entry. ELIGIBILITY – Accelerate Adventure with Truly Me Sweepstakes is open only to legal residents of the fifty (50) United States and the District of Columbia who are at least eighteen (18) years old at the time of entry. SWEEPSTAKES ENTRY PERIOD – The Sweepstakes begins on November 5, 2018 at 12:00 a.m. Central Time (“CT”) and ends on December 15, 2018 at 11:59 p.m. CT.
WINNER’S LIST – For a winner list, visit http://bit.ly/2IwYEbO. The winner list will be posted after winner confirmation is complete. 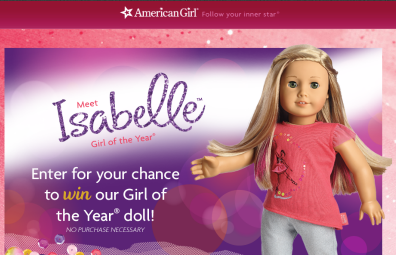 American Girl Isabelle’s Happy Meal Sweepstakes – Win the American Girl doll of the year & more! Win the complete Isabelle Doll Collection! ELIGIBILITY – This sweepstakes is open to legal residents of the 50 United States and the District of Columbia who are at least eighteen (18) years of age at time of entry. SWEEPSTAKES PERIOD – Isabelle’s Happy Meal Sweepstakes starts at 12:00:01 am Central Daylight Time (CDT) on May 23, 2014 and ends at 11:59:59 pm Central Daylight Time (CDT) on June 30, 2014. PRIZES – There will be one (1) Grand Prize winner and five (5) First Prize winners. One (1) Grand Prize winner will receive a complete Isabelle™ Doll Collection which consists of one (1) Isabelle Doll and three (3) Isabelle books (one (1) Isabelle book, one (1) Designs by Isabelle book and one (1) To the Stars, Isabelle book), fourteen (14) articles of Isabelle doll clothing, five (5) Isabelle doll accessories, and two (2) pieces of furniture for the doll, all of which will be selected by American Girl upon selection of Grand Prize winner. Approximate Retail Value (ARV): $750.00. The Five (5) First Prize winners will receive one (1) Isabelle™ Doll & one (1) Isabelle Book. ARV: $120.00 each.